CANNON BALL, N.D. - President Barack Obama says the relationship between the U.S. government and tribal nations is stronger today than ever. But he says there's much more to do to help Native Americans. He was in Indian Country for the first time as president, witnessing two sides of Native American life - a celebration of colorful cultural traditions on the powwow grounds and a view of the often bleak modern-day conditions on tribal lands. 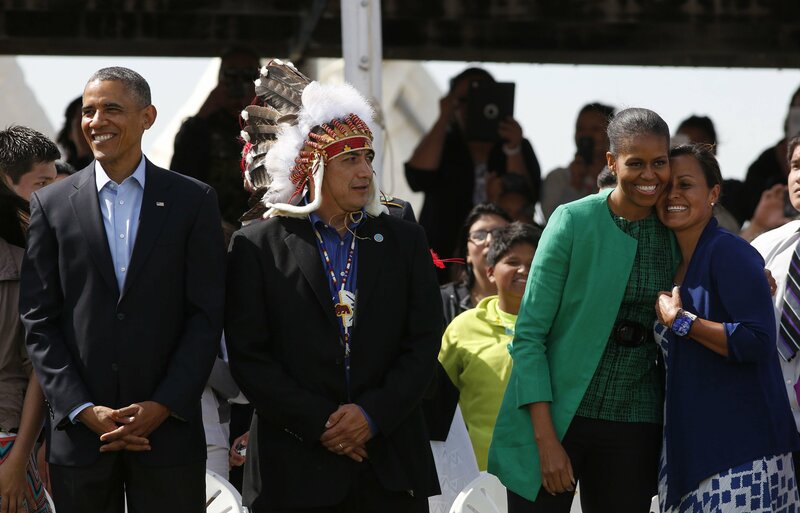 The president and first lady arrived by helicopter as native songs and dances at the Flag Day Celebration were already underway at the Standing Rock Sioux Reservation, which straddles the border between North Dakota and South Dakota. The couple first was meeting privately with tribal youth about their challenges growing up on the reservation that was home to legendary tribal chief Sitting Bull. Today, the 2.3 million-acre reservation is home to about 850 residents who struggle with a lack of housing, health care and education, among other problems familiar on reservations nationwide. The Bureau of Indian Affairs reported in January that about 63 percent of able workers on Standing Rock were unemployed. Obama pledged to help address the struggles of Native Americans when he was running for president in 2008, the last time he visited Indian Country. The White House said that during remarks to conclude his visit, Obama will recognize that more work needs to be done and will outline steps to improve Native American education and economic conditions. With Native American poverty and unemployment more than double the U.S. average, Obama plans to promote initiatives to spur tribal development and create new markets for Native American products and services. The U.S. Department of Housing and Urban Development announced Friday that it would make $70 million available to improve tribal housing conditions, including money for mold removal. Also coinciding with Obama's visit, Interior Secretary Sally Jewell plans to visit Standing Rock to promote a plan to overhaul the Bureau of Indian Education, which is responsible for educating 48,000 Native American students in 23 states and is lagging behind other school systems by nearly every measure. Native American students have low scores on assessment tests and the highest dropout rate of any racial or ethnic group. Obama, who will visit North Dakota en route to a weekend away in Palm Springs, California, is only the third sitting president to come into Indian Country in almost 80 years. In 2008, then-candidate Obama pledged to expand health services, improve education, combat methamphetamine dealers, promote economic development and improve housing on reservations. "This election is about Indian Country," Obama declared six years ago. Some residents of the Standing Rock Sioux Reservation said many of Obama's promises have yet to be met. Around Cannon Ball, a handful of houses sit with boarded-up windows, stray dogs roam and a group of young men hang out on a back porch in the early afternoon. The aroma of alcohol hangs in the air. "Around here, they need to do something, especially for the homeless," said Alma Thunder Hawk, who said her government-provided trailer home is uninhabitable, infested with mice and lacking running water. "I'm elderly. I've been trying to get help. Nobody will help me." Still, some on the reservation said they feel Obama has done better than his predecessors. Ron His Horse is Thunder, the tribe's former chairman, said he believes Obama has helped American Indians more than any president since Richard Nixon, assisting in settling lawsuits and prosecuting criminal offenders. Obama plans to note advances for Native Americans made under his administration, including resolving litigation, protecting Native American women from domestic violence, improved access to federal disaster assistance and tax breaks for tribal benefits. Curtis Brave Bull, a Cannon Ball resident, said he's seen people working ahead of Obama's visit to spruce up the town, which has seen hard times for many years. "This is like a ghetto on the prairie, but we now we have to clean things up," Brave Bull said. "So maybe something good will come out of it."